Featuring a round table with a pedestal base, this dining room set makes a perfect addition to eat-in kitchen areas or compact dining rooms. Perfect for couples and small families, this round table set seats four people comfortably. It has a thick pedestal base and dentil moulding around the table’s apron. 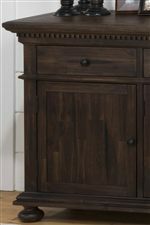 The Townsend Rustic Brown finish over the acacia veneer and solids construction provides a wire-brushed appearance for a trending vintage style. The chairs are decorative as well with padded seats and backs. The small table also includes a removable leaf that extends the table from 48 to 60 inches in length. Table Info Pedestal table that extends from round to oval with insertion of leaf.